After the Second World War new construction in the Netherlands took place at a frantic pace. On September 11, Postnl issued a postage stamp sheet featuring ten iconic buildings from this Reconstruction Period. 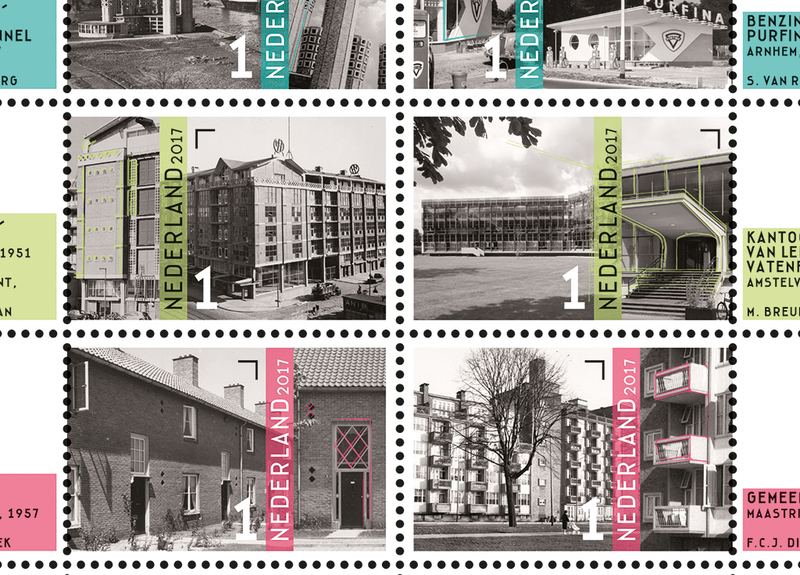 The photos on the stamps are from the State Archive for Dutch Architecture and Urban Planning. (Rijksarchief voor Nederlandse Architectuur en Stedenbouw). During the Reconstruction in the Netherlands bridges, roads, railways, housing and factory buildings were rebuilt, but there was also much attention for new construction buildings with a social function, such as schools, banks and government buildings. The designs of the reconstruction show a struggle between traditionalists and modernists and the resulting shake-hands architecture, the marriage between brick and concrete. 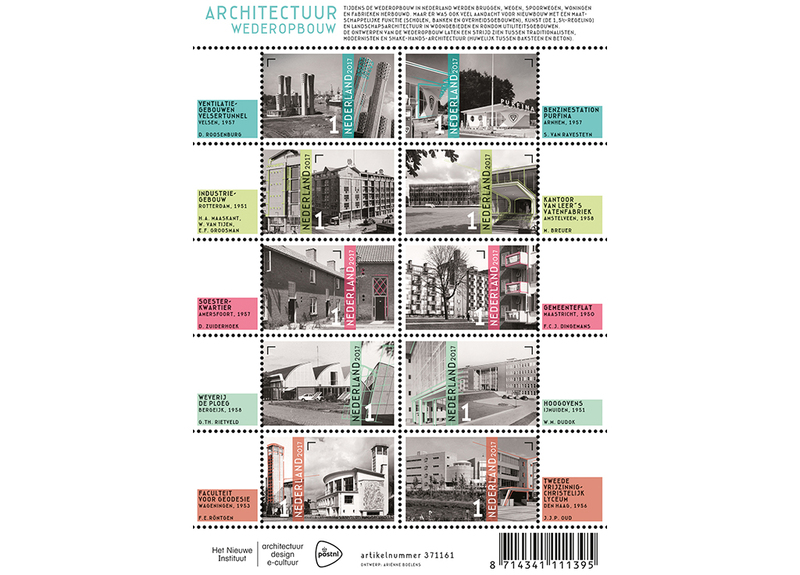 The stamp sheet features architectural photos of buildings from the early 1945-1960 period of reconstruction. Designer Ariënne Boelens opted for a visually powerful construction by displaying each building in black and white in both a general view and in detail. 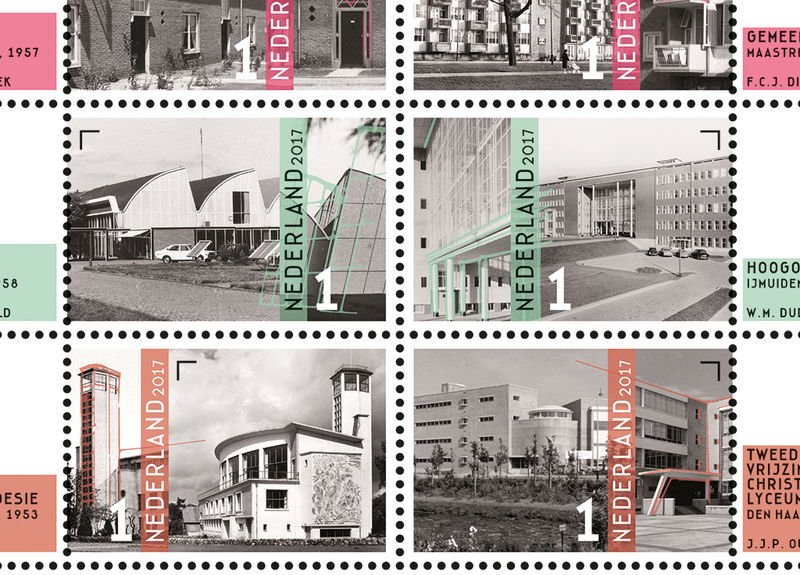 The photos on the stamp sheet include the Kantoor Van Leer’s Vatenfabriek (Amstelveen), Industriegebouw (Rotterdam), Weverij De Ploeg (Bergeijk), Hoogovens (IJmuiden) and the Faculteit voor Geodesie (Wageningen).